I recently had the pleasure of celebrating my second Baby Shower! We had a wonderful afternoon surrounded by family and friends and made some lovely memories! 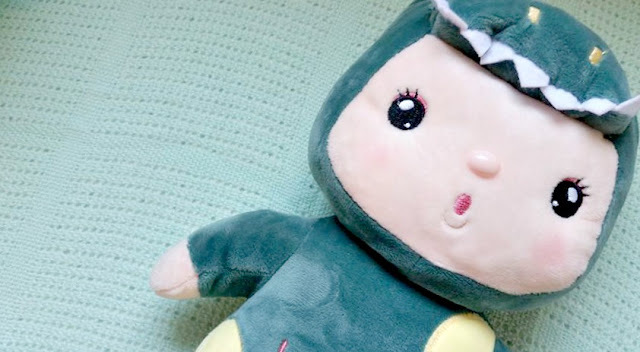 I am really not one to specify presents that I 'want' from people when it comes to having a baby as I know everyone's budget is totally different but I started to think what I would buy if I was attending a baby shower. I thought about some of my favourite brands/items we use a lot and some new product's I have spotted that would make perfect gifts. It's always important to consider the person/family you are buying these gifts for. If you are close to them you will know if they are planning to breast or bottle feed, use dummies, prefer certain colours or even favourite clothing lines. These things all help when choosing a gift but if you don't know the answers to those things it is often best to be cautious and avoid nappies, bottles, dummies etc just in case and a top tip....always ask for a gift receipt! When we had Ted's baby shower I was so grateful for all of the lovely things we got and everyone chose really thoughtful gifts. Some of the best ones were the most practical, the items we would use every day, so I have tried to include a few of these in my suggestions as well as the pretty things! Here are my gift ideas for a range of budgets! 1. Nana Knits! -These don't have to be something you have knitted yourself although if you can knit then hey you get bonus points from me! 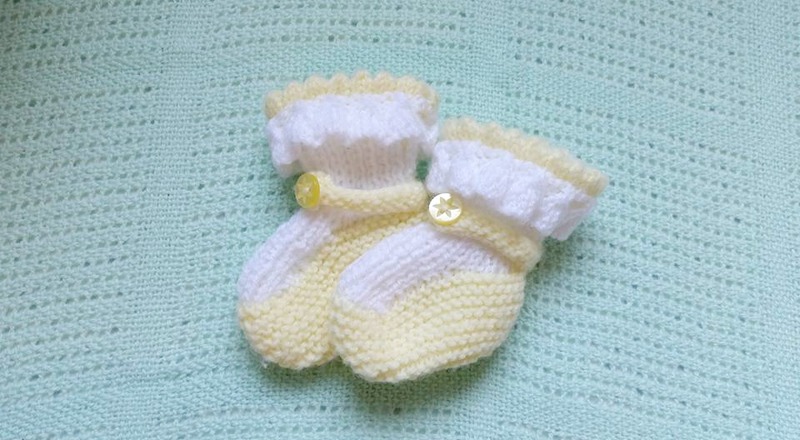 I adore hand knitted booties and cardigans on babies and my Mum got this little pair for us recently. You can pick them up at craft fairs, charity shops or local WI groups. They are usually super cheap but a lot of love has gone into making them and if your friend is expecting a Winter baby I am sure a pair of snug booties will be appreciated. 2. The Cuddledry Apron £29.99 - We had one of these gorgeous aprons with Ted and they were so practical. 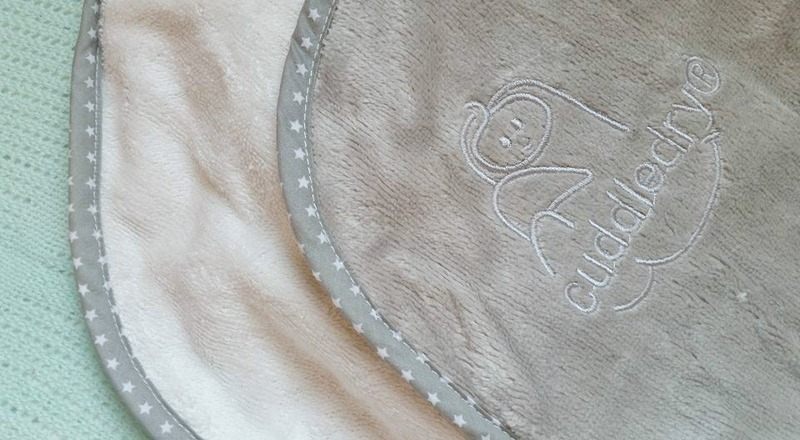 I am a Cuddledry Ambassador but in no way does that make me bias, I just love the brand! I am not going to lie they are a bit pricier than your average towel but 100% worth the money. Our original apron is still going strong but Cuddledry have recently released the grey and white stars design which is very on trend and still a perfect gift for new parents. 3. Unique Cuddly Toys - This one is a bit of a risk popping in here as I know most parents will agree that cuddly toys are the single most annoying thing a child has. They literally multiply on their own don't they?! However, my Sister picked this beauty up from Malaysia while she was on holiday and I think it is adorable. I always think it is lovely for a new baby to have a buddy to play with and soft toys are also great to get those newborn photo's with. Try to be original though and pick something that stands out from the cuddly toy crowd. Ted's Finding Nemo comforter has been his best buddy since day 1 and although not so unique now Finding Dory has come out, he really was a special toy in 2012! 4. Dotty Fish Taggie £8.49 -These beautiful little tag blankets are very sweet and come in a range of designs. I love this one with the Cath Kidston print and hopefully it will be something baby girl can treasure. 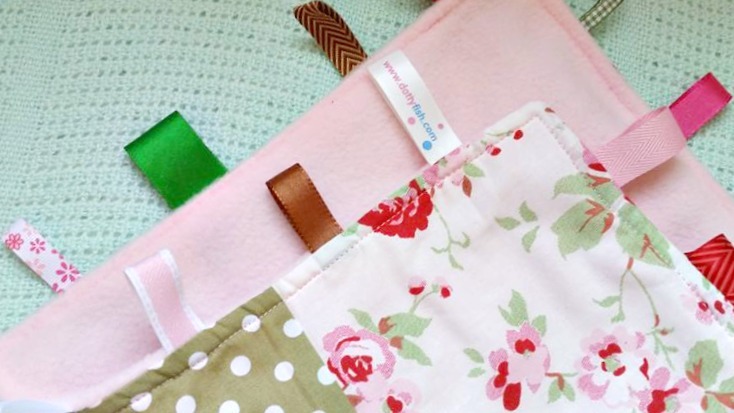 They are a great little gift and really special as far as comfort blankets go. 5. Toys - Something that can be put away for the child to grow into. 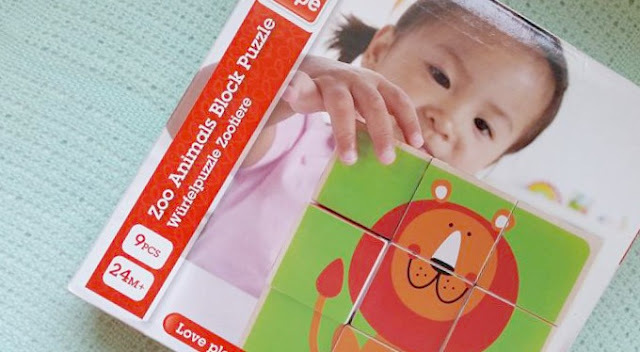 These Hape building block puzzles are great as they are always going to be fun for little hands to play with and the bright colours and simple patterns make for great learning games. I love that the Hape range varies in budget with these blocks being around £10.00. 6. 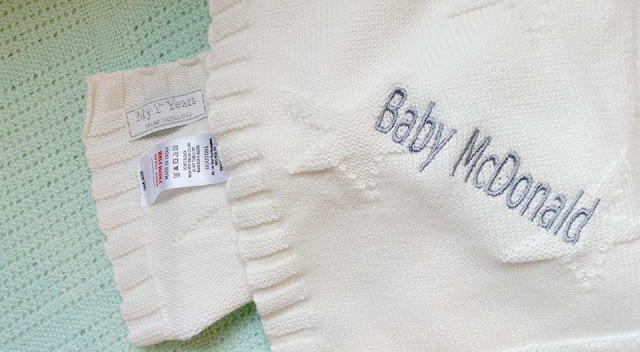 A personalised blanket - We had no idea what our baby girl was going to be called when she was here but when I won this gorgeous blanket a few years back (before we were planning another baby) I knew our future children would be McDonald's so got this made up. This amazing blanket is from My 1st Years and is really big and so soft. I have packed it in my hospital bag and I am sure any parent would cherish a personalised blanket! This one is £35.00. 7. Teether from NibBling £10.00- This colourful teether is great for little hands to grip onto and comes in so many colour combinations. Sooner or later those teeth are going to make an appearance and this will be appreciated. 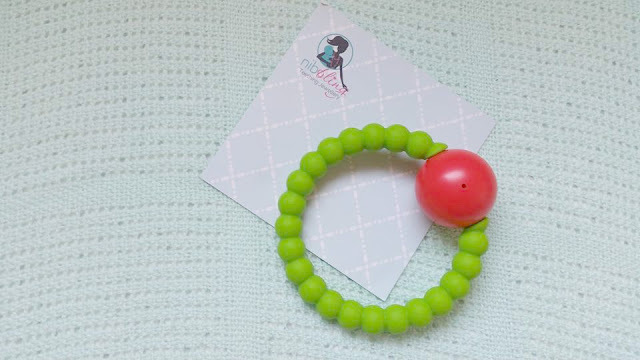 This one is also a rattle so great for tiny ones to play with in those early months too. 8. 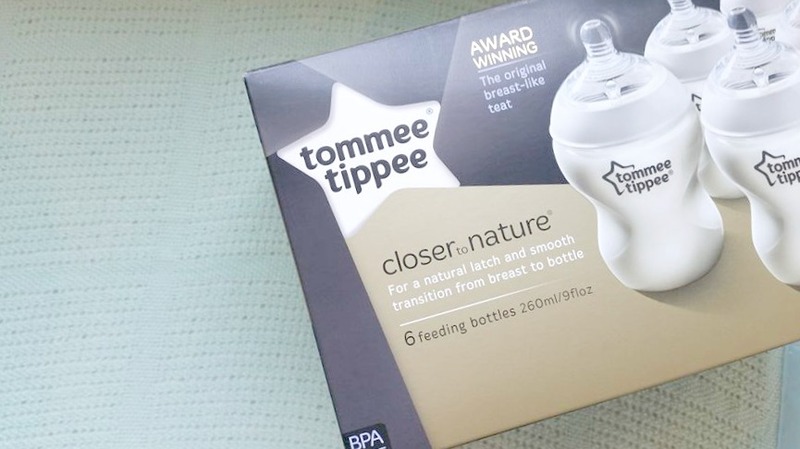 Bottles - This is a gift that would be on my list because we are choosing to formula feed but like I mentioned it won't be for everyone and I only recommend these if you know the parents well. These Tommee Tippee bottles are a favourite of ours and I know there are some pretty designs as part of the range that would make fab gifts if bottles are what your friends need. So there are some of my suggestions for great baby shower gifts. 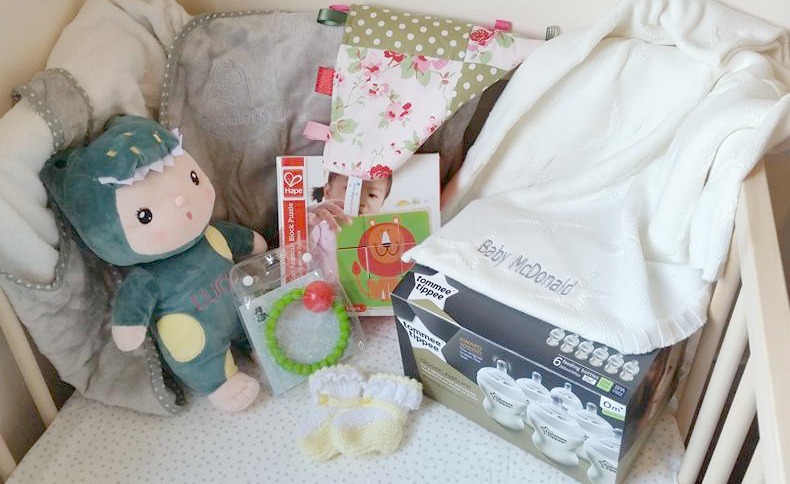 Some of the lovely bits I got included lots and lots of clothes, blankets, cot bedding, nappies, wipes and even a little bracelet for baby girl to wear for special occasions! *this blog post features some sample items sent for my honest review. As always all opinions are my own.